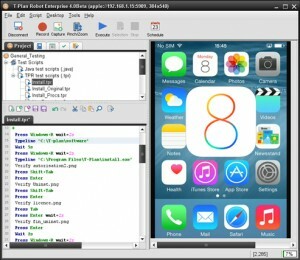 Test Automation on iOS 8 is now possible with T-Plan Robot Enterprise. Driving a NON-Jailbroken (not rooted) REAL device, or simulator, has never been easier! Utilising T-Plan Robot’s amazingly new simple image capture & playback technology, we can now shout that we have focused mobile test automation, back into the testers domain. With alternative solutions being very technical and prone to many weeks of development by developers, T-Plan’s solution is not only easy to use, but more importantly easy to learn and setup. This means that return on investment can be realised almost immediately, and managers returning upstairs with a smile on their face!